My name is Ahmed Jahaf. I am a graphic designer and artist living in the Yemeni capital, Sana’a. 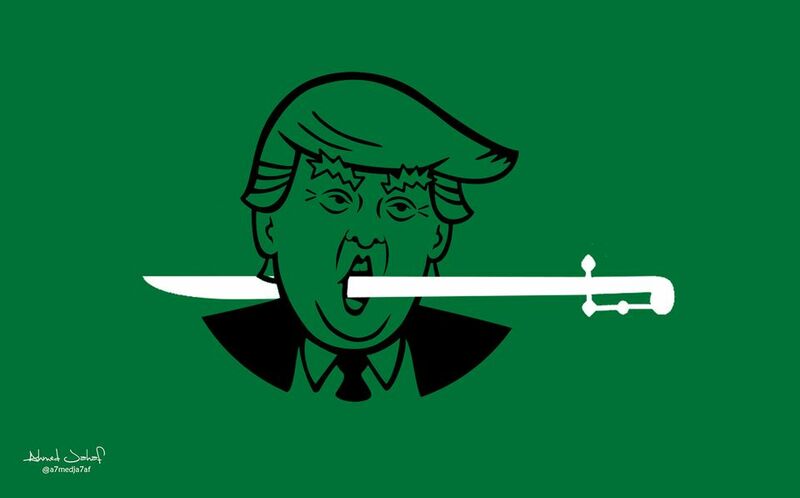 My work is inspired by the Saudi Arabia-led war on my country. I live under constant bombardment and blockade. We have all been living like this since 26 March 2015. It has been more than 900 days since the “forgotten war” started in Yemen. We are facing the world’s biggest food-security crisis, with more than 17 million starving civilians. We hear the sounds of jets flying and bombs destroying buildings and killing civilians. We are also now dealing with a spiralling cholera crisis. 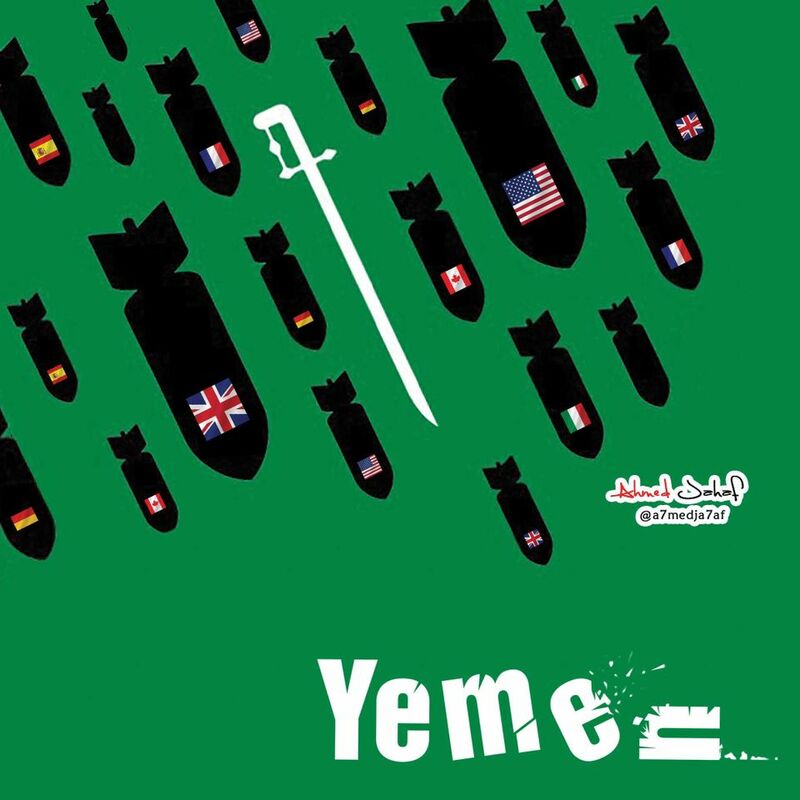 In 2015, a coalition of countries led by Saudi Arabia began bombing and imposing a blockade on Yemen with the support of the US and UK governments. So I decided to speak out and try to break the media blackout. I’m angry because the US and the UK are supporting the Saudi-led coalition and are still selling arms to Saudi Arabia. I’m just trying to show the ugliness of war—what happens during a conflict while the world watches in silence. This is my way of protesting against the injustice of this forgotten war—and of asking for peace. I spend my days watching the news and recording events such as air raids on social media. I make works at night, using Adobe Illustrator and Photoshop. I’m using my artistic talent to garner publicity and to draw the world’s attention to the situation here. My work is starting to break through; I recently had an exhibition here in Sana’a and my prints were shown at the Art the Arms Fair in London. Among my works, the image that has had the most impact depicts the globe, showing Yemen as a blood-red area with a plume of smoke. Another shows the Statue of Liberty standing among the rubble of a destroyed Yemeni building. I also depicted a young child, Buthaina—the sole survivor of a recent air strike that killed her parents, five siblings and an uncle. Last year, on 8 October, 145 people were killed and there were mass casualties after an attack on a funeral in Sana’a. Many people were blown to pieces. The funeral hall massacre was not reported or covered like other foreign massacres—after all, they’re only Yemenis, and this is the forgotten war.